Canadian residents anxious to schedule diagnostic tests or receive walk-in care don't have to wait for lengthy periods. 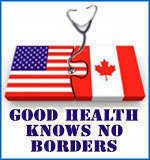 Healthcare services are available to our neighbors from Canada at War Memorial Hospital. Consider WMH if you are in need of …. Walk-in care for things like sprains, minor lacerations, infections, foreign body removal, flu, and more. What can you expect at War Memorial? We know that our healthcare system is structured differently than what Canadian patients are accustomed to, which is why we have a Canadian Concierge to help you navigate the system. Call or email the Canadian Concierge with questions about scheduling appointments, making payment arrangements, pricing for certain services, and more. All services require up-front payment unless the patient has U.S. insurance accepted by WMH. For those paying cash, WMH will accept cash or credit card. As is the case with our U.S. patients, cash-pay patients receive a 30% discount. Why wait for healthcare services? The Right Care is Right Here in Sault Ste. Marie, Michigan!